We’ve entered the Age of the Customer. Today’s customer is more empowered than ever before. They want what they want. And they expect it now easy, and designed for them. Engaging your customers in the way they prefer – whether in store, at home or work, or via their mobile device requires you to be responsive and agile. The barriers to switching are eliminated in this competitive global economy, if you don’t provide an exceptional customer experience from the first critical interactions, they’ll abandon you. With just the swipe of a finger. This is what businesses refer to as the First Mile™ challenge. Getting customer interactions right from the start drives success, increased revenue and profitability. For the past 20 years, “systems of record” have run our business. These are all the ERP, CRM, ECM and other enterprise systems that run our core business processes and store business critical information. But these systems are only as good as the information that goes into them. Business is changing: Information is growing more complex. Channels are becoming more varied, IT is becoming “consumerized,” consumers are more demanding. Customers have grown accustomed to instant access and rapid response. Always-available cloud-based solutions create a 24-7 service expectation. “Systems of engagement” are increasingly mobile, with customers relying on their favorite devices to engage with your business. The benefits of Kofax solutions start when you engage your customer at the Point of Origination™ – where your business processes begin – enabling you to improve customer satisfaction. Information gets captured, perfected and utilized faster than ever – and process latency is eliminated, collaboration and decision making is enhanced. Smart process applications bridge the gap between the back office and the customer. Regardless of when and where the information is first available, Kofax solutions enable customers to extend systems and business processes to the Point of Origination. Capturing information and content at the Point of Origination is just a start. 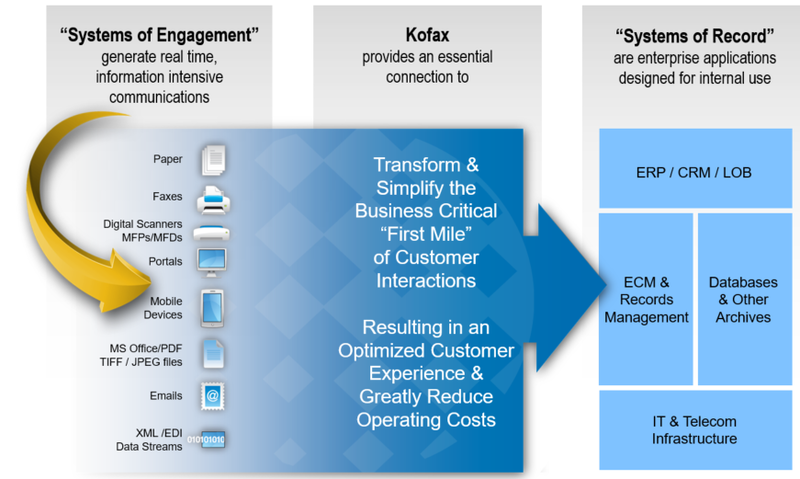 While Kofax had the vision to build our comprehensive solution well before the emergence of Smart Process Apps as an official “category,” we were delighted when Forrester introduced this image of 5 components required for an effective smart process app. The Kofax solution overlays this “map” extremely well. Kofax captures paper & electronic information regardless of how, where & when it arises & easily integrates with any system of engagement or system of record. Paper documents & forms can be captured using production scanners, multi-function peripherals (MFPs), desktop scanners & even mobile devices at the Point of Origination where customer facing interactions occur. Electronic content can be captured from faxes, emails & attachments, web portals, text messages & EDI or XML data streams. Kofax is a “Visionary” in Gartner’s “Magic Quadrant” for business process management & a “Leader” in Forrester’s “Wave” for Dynamic Case Management. Kofax collaborates with systems electronically via inbound & outbound email, SMS & MMS messages & features powerful integration with Microsoft applications, including SharePoint, Dynamics, Office 365, Lync & Exchange Server. Kofax features embedded BI & analytics, end-to-end process & data analytics, visualization for monitoring, reporting & dashboards, simulation & predictive modeling & ETL capabilities that interface with most systems of engagement & systems of record. Kofax leverages mobile devices in its capture, BPM & dynamic case management capabilities to provide easy to use & efficient collaboration with customers & inside your organization. Capture, business process & dynamic case management, mobile & analytics in a single, fully integrated product offering. Highly flexible & scalable architecture. 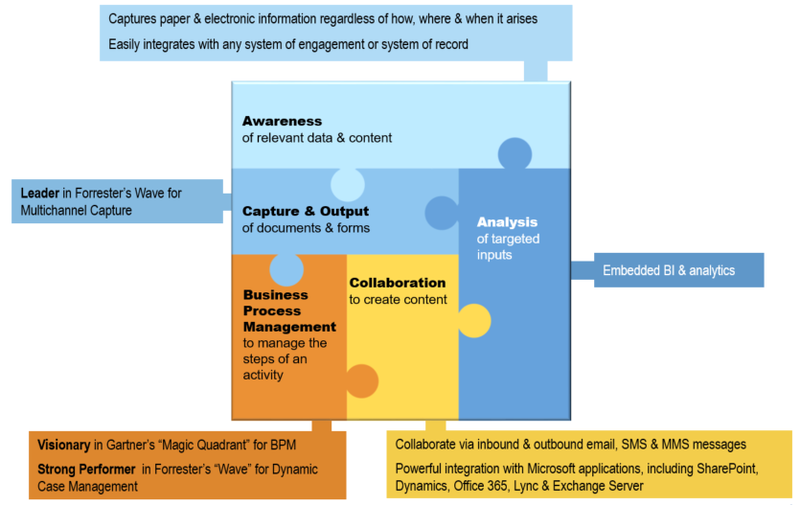 Open solution that easily integrates with any “system of engagement” & “system of record”. Available on premise or as hosted SaaS subscription offering. Large installed base of more than 20,000 customers. Deep vertical market knowledge & expertise. Trusted market leader validated by third party experts. Make your business critical First Mile of customer interactions smarter. Optimize your customer experience. Leverage mobility to enhance the customer experience and bolster loyalty. With mobile devices and information capture technology, your customers, agents and field workers already have enterprise class scanners in their pockets. Reduce time between “engagement” and “action” for better service. By combining the front-end collection of customer information with the backend processing of that information into a single integrated and automated process, the process completes much sooner for the customer. Empower customers and increase their visibility and control over the process. Keep customers, agents and field workers engaged and informed via status updates in a web portal or text/email communications, so they never have to wonder what’s happening in the process, what’s been completed, what’s next, and when it will be complete. Reduce complexity and effort at touch points to drive costs down. By empowering your customers with the ability to self-serve in the manner they choose, you not only give them the control they desire, but you also move work from your knowledge workers and drive costs out of your process. Gain insight into, and continually optimize and improve processes. New systems of engagement require more than BI – they require real-time, in-process, adjustable views of all types of information used during the process, combined with information from other internal and third party systems. Armed with this information all in one place, knowledge workers can make better decisions, faster. Make it easy to connect systems of record with systems of engagement. Bridging the gap between systems of record and systems of engagement is the key to realizing all these benefits. But it needs to be simpler, less costly and less time consuming than replacing or modifying existing systems of record. Creating a link between these two worlds requires a service oriented architecture that leverages web services and removes the need for custom integrations. Contact us for more information regarding Kofax First Mile.